The Spaniard Fernando Sor (1778-1839) was one of the greatest of the composers for the classical guitar. 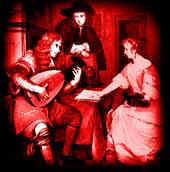 In addition to many "serious" works for one or two guitars, he composed a large number of studies intended for players of lesser virtuosity. Untold numbers of students have worked their way through these studies, which satisfy the elusive goal of providing memorable pieces that, at the same time, enhance the skill and knowledge of the practitioner. Andrés Segovia selected a set of twenty of those studies, each emphasizing a particular aspect of technique, and these are now some of the best known of Sor's works. Versions of those studies have been reworked and edited for the MIDI format by Ray Izumi on The Guitarist site. Fernando Sor works are listed in 63 opus numbers. These range in style and forms such as Duets, Theme and Variations, Fantasies, Waltzes, Sonatas and groups of Studies. The book Fernando Sor, Composer and Guitarist by Brian Jeffery, published by Tecla, is a full-length biography of him, with a complete and detailed bibliography of Sor's many compositions (which include a great many for voice or for other instruments). The book was first published in 1977 and is acknowledged today as the standard biography of Sor. A new edition appeared in 1994, but it can be very hard to get so if you see one available buy it on the spot! Andrés Segovia (1893-1987) is considered to be the father of the modern classical gutiar movement by most modern scholars. Many feel, that without his efforts, the classical guitar would still be considered a lowly bar instrument, played only by peasants. Segovia's quest to elevate the guitar to a prominant position in the music world, began at the early age of four. His uncle used to sing songs to him and pretend to strum an imaginary guitar in his lap. Luckily for us, there was a luthier nearby and Segovia took an instant liking to the guitar. Although discouraged by his family (according to them he should play a "real" instrument), he continued to pursure his studies of the guitar. He set a goal for the guitar and himself early in life. It was, to bring Guitar studies to every university in the world, have the guitar played throughout the world, on every major stage, just as the piano and violin were, and lastly, to pass on his love of the guitar to generations to follow. He considerd himself to be the messenger that would complete this impossible quest. He succeeded in all respects. In 1928 Segovia made his American debut in New York City. Before long, composers like Heitor Villa-Lobos even began to compose original pieces specifically for the guitar. Segovia himself began transposing the classical canon for the guitar as well, most notably his notoriously difficult translation of Bach's Chaconne, as well as many transcriptions of lute and harpsichord music. In addition to recording and performing, Segovia spent the remainder of his life and career successfully influencing the authorities at conservatories, academies, and universities to include the guitar in their instruction programs with the same emphasis given the violin, cello and piano; his early struggles were recounted in his 1983 memoir Andres Segovia: An Autobiography of the Years 1893-1920. He died in 1987. Christopher Parkening (1947-) has been one of the premiere classical guitarists for the past twenty-five years. He has recieved three Grammy nominations for best classical performance and he holds an Honorary Doctorate in music from Montana State University; where he teaches a master class each summer. 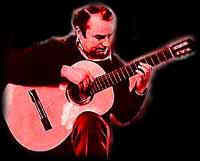 Mr. Parkening has inherited the legacy of Andrés Segovia, who was the father of the modern classical guitar movement. He continues to inspire and awe audiences around the world with his technical brilliance and musicianship both. Performing over 80 concerts a year Interview with Classical Guitar Virtuoso Christopher Parkening. Student and friend to the legendary Andrés Segovia, he gives us some valuable insights into developing the right skills early on. In the words of Segovia, "Christopher Parkening is a great artist. He is one of the most brilliant guitarists in the world"
John Williams was born in Australia in 1941. He began to learn the guitar at the age of four, receiving lessons from his father. When the family moved to London in 1952, he met and studied with Segovia, and on his recommendation entered the Accademia Musicale di Siena in Italy, where he studied on a scholarship for five years. At the request of his fellow students, he received the unprecedented honour of giving the first complete solo recital by a student of any instrument. Back in England he attended the Royal College of Music, where he studied piano and music theory. Julian Bream Proclaimed by many students of classical music as the premier guitar and lute virtuoso of the 20th century, Julian Bream was born in London in 1933. After studying at the Royal College of Music, he made his public debut in 1950, quickly winning fame for his technique and mastery of a wide range of musical styles. In 1960, he founded the Julian Bream Consort, an ensemble of original instrument virtuosi which enjoyed astounding success in their chosen oeuvre, greatly revitalizing interest in the music of the Elizabethan era. Laurindo Almeida (1917-1995) Brazilian guitarist, composer & arranger. He refused to stick to classical, Brazilian or jazz guitar - he played everything with equal success. It is rather dissapointing to discover that this great guitarist and composer is today relatively unknown in Brazil, while in USA in Europe he is considered one of the greatest guitarists of all times. His work is unbelievable - he composed music for over 800 movies & TV series and recorded numerous LPs and CDs. I started taking classical guitar lessons at age ten. I was eleven when I saw Andrés Segovia in concert - I was inspired and started taking my lessons more seriously. Eventually I entered the University of New Mexico school of music and took master classes from the head of the guitar department, Hector Garcia, one of the prominent Cuban guitarists who left Cuba during the Castro-lead revolution of the late fifties. I performed at a number of restaurants in Santa Fe and also studied Flamenco techniques. As well as being influenced by the great classical guitarists (Andrés Segovia, John Williams, Julian Bream, Carlos Barbosa-Lima, Sharon Isbin and others), I am a great lover of jazz music and inspired by musicians like John McLaughlin, Larry Coryell, Pat Metheny and Bill Evans. Petar Culic Is a relative newcomer having given his first public performance in 1993, and entering his first competition in 1997 - which he won. 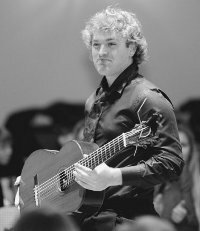 Since then he has gone on to win another 22 national and international classical guitar competitions, and he has given over 1,000 performances in his native Croatia, and around the world. He is highly regarded having been called "The prince of classical guitar", and received rave reviews for his performances. He is constantly performing, and you can find his tour dates as well as listen to YouTube recordings via his website at PetarCulic.com.